‘Looper’ is not your average sci-fi film, yes it may contain all the classic hallmarks of the genre; time travel, telekinetic powers and new gadgets, but it manages to rise above its genre trappings to create a fresh, thrilling and hugely enjoyable to take on the subject. The film is set in 2042, and confusingly 2072, where in the not so distant future time travel has been invented, and subsequently outlawed, only to be used by the criminal underworld as a way to dispose of unwanted associates. Joseph Gordon-Levitt plays Joe, a ‘Looper’, an assassin who waits for his victims to arrive 30 years in the past before quickly, and efficiently, disposing of them for a handsome payment in silver. Joe’s life of fast cars, hard drugs and quick kills is thrown into turmoil when he finds his latest target is none other than his future self, played by Bruce Willis. Joe’s surprise at being faced with his future self allows him to escape, setting a whole chain of chaotic events in motion. Future Joe has his own agenda to change the past, while his present self hunts him down under the watchful eye of manic mafia boss Abe, played by Jeff Daniels. The film settles down to be a battle of two men from different eras; future Joe is trying to change his past for the better while is younger self is attempting to shape his life for the future. To tell anymore of the plot would be to give away too much of what is a gripping and intriguing thriller. The success of the film boils down to director Rian Johnson’s fresh take on the genre of sci-fi and time travel, where rather than focusing on the future sci-fi elements and special effects it is the characters and plot that take centre stage. The problem many films have with elements of time travel is getting stuck in the technicalities of the subject and end up confusing the audience. 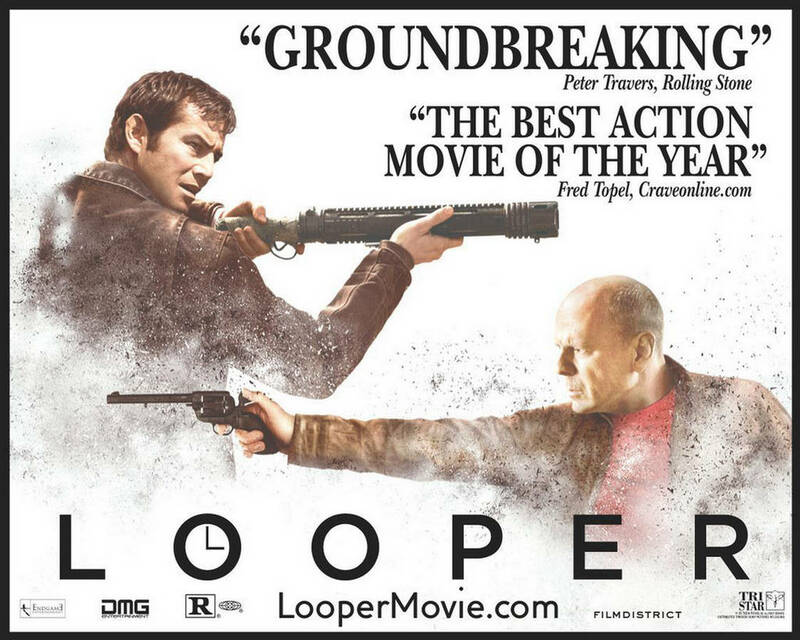 ‘Looper’ avoids these mistakes with a slick, well devised story. The concept of a Looper and time travel is succinctly explained to the audience at the start of the film to avoid any confusion later on. It is a testament to the superb story telling that you won’t be leaving the cinema debating how viable the logistics of time travel really are. Joseph Goron-Levitt follows on from his strong performances in ‘The Dark Night Rises’ and ‘50/50’ playing an unfamiliar role as an ice cold hitman. Gordon-Levitt is expertly made to look more like his ageing self in Bruce Willis with some subtle cosmetic work, although we all know Bruce Willis never had that much hair in his youth. On the other hand Willis does a solid, if not spectacular, job as a bitter, resentful man destroyed by his past, hell bent on making the future a better place. One of the most memorable scenes in the film is when Willis and Gordon-Levitt first come face to face in a diner, although brief, the meeting between the two is a hugely engaging exchange and a chance to see Gordon-Levitt’s impressive likeness to Willis. The supporting cast of Emily Blunt, Jeff Daniels and youngster Pierce Gagnon all add to the film in their own unique way, with Daniels giving a bulk of the humour with his witty lines. Another success of the film is its dystopian setting, reminiscent of the warped future seen in A Clockwork Orange. The year 2042 is not overly futuristic, with only a handful off changes to the present day. The underplaying of traditionally sci-fi elements adds to Director Johnson’s vision to use the future as merely a setting rather than a focal point of the entire film, allowing the character, plot and cinematography to flourish. The influence of Johnson’s earlier movie collaboration with Gordon-Levitt, ‘Brick’, can be seen in the hard-boiled elements, notably Joe’s inner monologue and narration of parts of the film. This is just one influence of many on the film; Johnson manages to successfully combine a string of cinematography approaches in order to keep the audience engaged, for example often scenes are told from multiple character perspectives as they happen. Although the film is extremely well directed and coherent it does have a few slightly disappointing moments. The film does lose its way slightly in the middle, and a prolonged scene involving Joe and Sara, Emily Blunt, and her son on an isolated farm does take some of the momentum out of the fast paced action either side of it. The ending itself, although extremely satisfying and largely unpredictable, does seem to be a bit rushed and maybe doesn’t quite reach the crescendo of excitement that the film deserves for its efforts. ‘Looper’ does not reinvent the genre of sci-fi and time travel but it most certainly does give a very unique spin on a well-trodden path. It may not have the special effects or set pieces of ‘Inception’ but it more than makes up for this with a witty script, engaging acting and above all else, a story that is executed perfectly to keep the audience on the edge of their seat. Far and away one of the best sci-fi efforts of the last few years.